« Will you please forgive me? What a blessing! It is so beautiful! Congratulations! Wow! Congratulations on your new home, it looks beautiful. I’m so happy for you and your family. And no payments, wonderful! God IS good! Thanks for showing the fruits of your labors!! How wonderful!! You guys are a true inspiration of perserverence and honoring Him!! We hopefully can be in the same position soon!! Thanks for sharing that it can be done when you stay faithful to His plans!! I am so excited for you! I’ve been following you since the Biblical Womanhood days, so I’ve seen the journey you have taken to get here. Congratulations! I do have a question: you wrote once that you put the house savings into a mutual fund. Did you move it to somewhere else when you were ready to look, or did it stay in a mutual fund until you had to hand over the cash? Again, it is so wonderful to see God bless your trusting Him to provide! @Anne P., I, too, am curious about this! Wow!! This house (or kitchen anyway) is absolutely gorgeous! And to believe that every single inch of that space is owned free and clear by you and your husband! Our little joke each time we make the mortgage payment is that now we own a little bit more of the house….but you own it all! God has truly blessed your family….and you continue to be a blessing to all of us. We would love to see any other pictures you may have to share. I’m sure for privacy you can’t show a picture of the exact house. Can’t wait to see what else you are willing to share with us! Congratulations Crystal! God has truly blessed you! We would love to see more pics!!! God is so good! Congratulations on your beautiful new home and thank you for the inspiration! I love your kitchen! How wonderful to own your home. Thank you for sharing all of this with us. You guys are both an inspiration to us. This was a beautiful story. Congratulations on your home-sweet-home! Wow, I can’t even imagine paying for a house in cash! You are a role model and your hard work has paid off! I love that kitchen!!!!! Congratulations–I teared up reading your post! I have been waiting for this post!! I am so excited for you and want to thank you for being an inspiration to me and so many others. You totally deserve this!! Congratulations! Wow! This brought tears to my eyes! Though I’m not yet married or even receiving a steady income, your story is a great example to me and those like me to save and be frugal now. Thanks so much! I’ve been waiting for pictures! Thanks for sharing with us all! What a gorgeous house! Congratulations! God bless you! The home is beautiful and what a wonderful thing you did. I love that stovetop!!! great for cleaning!!! It’s such a blessing watching what God will do when we get out of his way and follow his lead. Your journey has been an inspiration to many wives, moms and women. As you grow in favor with God continue to use your blog (ministry) to encourage us all to follow God in all things. Your sister in Christ, Saidah! Hooray, Crystal! God is SO good! Enjoy YOUR (well, the Lord’s) home and may He bless others through it! Thanks for the pictures! =) What a gift from God, and so amazing to see how He has led you. He indeed loves to give good gifts to His children, doesn’t He?? Congratulations! I’ve got tears here. The kitchen/dining area looks magnificent, as, I’m sure is the rest of the house. So happy for you! Congratulations! Your story has inspired me to begin planning my own cash home. Thank you for your example of seeking God in all things and patience and perseverence. Congrats Crystal! I am so happy for you and your family. You and your husband work so hard and deserve nothing but the best. What an amazing story!! Please post many more pics of you and your family in your new home! We just bought our first home a few months ago. However ,We are making payments. It has to feel so good to own a home out right and having all your hard work pay off!!! Congrats! It’s a beauty! beautiful kitchen! you’re an inspiration to many, including us, who plan on having the 20K saved within the next 5 years for our dream home! thank you for the blog, it’s been amazing saving all of this money! Seriously…I’ve been waiting for this post ever since I started your reading your blog almost a year ago. It’s like I could hear angels singing, or like I was standing at the end of an awesome concert and I just wanted to stand up and scream and yell “WOOOOHOOOOO!! !” I am so incredibly happy for you and I don’t even KNOW you other than what you have blessed me with in sharing from your life and your heart on your blog. I am living vicariously through you right now. I am in a completely opposite situation, living in a home that is totally upside down in value/mortgage, and thinking I wish I could go back and do things differently. I have been encouraged lately that God can turn “curses into blessings” and I believe that He can use my situation for His good! I pray He does and stories like yours give me such a desire to continue to press on! God Bless You and all the new adventures you will have in your beautiful, hard earned, God Blessed HOME!!!!! Angles are singing!!! Thank you for living an obedient life and living it as an example for us. I know you are not perfect, but am SO excited for you!!!!!!!!! Wow! What a beautiful home. You are an inspiration to those of us who have done all of the “don’ts” first and are looking to get on the right track. Congratulations! The Father is so good to us!!!! Praise God for his blessings! Enjoy your new home. Thank you for sharing your photos! Wow this is great! Isn’t God the best!! Yeah! Your kitchen pics and post brought tears to my eyes. Thank you for including us in your journey. Rejoicing with you! Congrats Crystal!! You’re really a role model!! Congratulations! May He continue to bestow his blessing upon you! Wow. I’m in awe of your accomplishment. And are those wall hangings that you already put on your walls? I know these are post-move-in pics cause we all recognize that dining set from your grocery pics, lol. Congrats…what a blessing it is to read that it is possiable to have your own home debt free. My husband and I have been building our own home…debt free. We are at one of our down days/weeks….but, this is such a encouragement knowing if we are faithful, one day we will have it built. We are also at the point where do we ditch the clunker car…..which would put us behind getting our house done another year. Thanks so much for your emcouragement…couldn’t have came at a better time! God is Good! That is such a great testimony. Enjoy God’s blessing, it is beautiful. Congratulations on your new, paid for home! Your kitchen is BEAUTIFUL! What a great testimony to God’s goodness! Congratulations on your dream come true! That’s awesome! 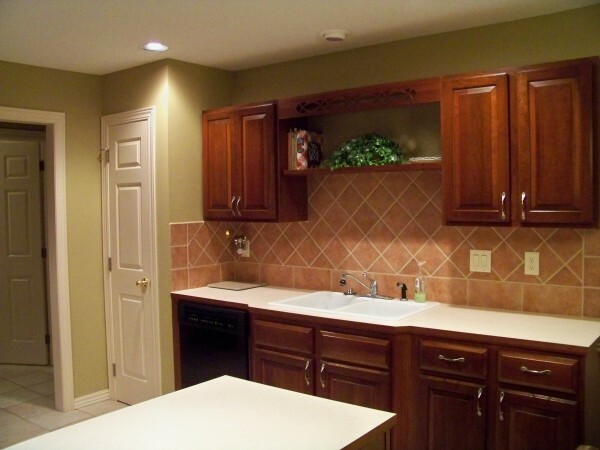 Wow, you were right about that kitchen….GORGEOUS!! 🙂 Trying not to be jealous! Want to hear some crazy? I am actually tearing up, I’m so proud of you! My hubby and I weren’t raised very well, money-wise, so we were half-way through our twenties before we even opened a savings account. You’re an inspiration. Someday, I hope to be where you are right now! Beautiful testimony, lovely home. Blessings. Congratulations, Crystal! I love your blog! You showed that it’s possible to save and buy a house for cash, despite all the people who think it can’t be done. I have the goal of saving to pay cash to buy a house, too! I am 18 and hope to live my life to serve God, and eventually my own family. You are such an great example of this and an inspiration! I so enjoy reading about how you save money and live a God-honoring life, and it’s so fun to see pics of your adorable kids! Awesome, and am I right in noticing that you already have pictures of your family up on your fridge? 🙂 Congratulations. Crystal I am so proud of you and excited for you at the same time. What an accomplishment! Praise God for the blessing he has given to you and for your faithfulness.This is something my husband and I have been working on for some time now. We have finally managed to pay off all of our credit cards and both of are cars. If it hadn’t been for the flood we would be on our way to paying off our house as well. It is so wonderful to see a fellow blogger so open about God on their blog! I FEEL AT HOME! Wow – congratulations!!! Like many of the other readers, I too teared up reading this. What a remarkable accomplishment! Your kitchen is so big! Congratulations! How exciting for you and your family and what a beautiful place. My husband and I hope to do this one day for our second home. We made many mistakes with our finances and purchasing our first home and are now awaiting the completion of a short sale on it. We are now following Ramsey and hope to one day accomplish this same thing. Thank you for the encouragement to see that it IS possible! this is a gorgeous kitchen!! congratulations..i love it! I am in tears, Crystal… I, too, have been following you for years and I am amazed at your accomplishment. I am sending love and blessings all the way from Charleston, South Carolina! 😀 You are truly an inspiration! Thank you for sharing your story with us! Wow! Congratulations, Crystal and Jesse! the home is gorgeous! what an amazing blessing for your perseverance! now to save for your new car. 🙂 happy settling in! I am a long-time follower of your blog(s) but never left a comment before. While there are many differences between us (I am a very satisfied professional who does not feel called to establish a family of my own), I share with you and understand the commitment for successful home management – including savings, healthy living, and smart food planning – the passion for a life of service to others, and of course the faith in God’s plan for us all. I have greatly enjoying reading about your and your family’s walk through life, and I have benefited from many of your tips. Now, as your dream became reality, I would like to congratulate you and let you know that I am really happy for you. You have been and continue to be very inspirational to me. God willing, and if things continue to go as planned, I too will be able to purchase my own home in about 2-3 years. Many wishes of joy to you and your family, and may God continue to bless you abundantly. Now go call Dave Ramsey!! That kitchen is gorgeous! I would also like to save cash for our next home, but I’m having trouble coming up with a realistic timeline. How long did it take you to save? Thanks! Crystal blogged about the whole process. I believe it only took a few years! This blog’s income, and God’s blessing, worked wonders in a short timeframe! What a beautiful home! Congratgulations on meeting your goal. You are truly an inspiration! Ughh – I had to wipe the tears just to post this. It is beautiful. Crystal I am so happy for you and your family – and also for all of us readers!!! Because your accomplishment goes so much deeper than just your own family. You’ve inspired thousands of us to go against conventional thinking and work toward something better because we can see that it’s possible!!! What a beautiful home! Thanks for sharing your story and pictures. You are richly blessed. I am on the verge of tears seeing how God has blessed your family. WOW…Our God is an AWESOME God!!!! I’m speechless at His provision! I belived this has given me confirmation on something my husband and I have been praying and thinking about regarding the mortgage on our home. WOW!! No offense to anyone, but who wouldn’t serve a God like that!! How totally AMAZING and how totally inspiring! WOW! This is something everyone should read and think about! I have reposted it on my facebook for all of my friends to see and hopefully some of them will also share! Thanks for posting this and you deserve to enjoy every moment in your new home! You have went through a lot to get here and it must feel totally WONDERFUL! What a beautiful kitchen and dining area! 🙂 And I’m guessing based on your testimony, you will use this home to show true hospitality and share the gospel in that kitchen and around that table. What a wonderful blessing. Exciting for you!!! Congratulations! This is a great end to a great story! I’d love to know what the realtor and the previous owners said/thought when they found out you were paying CASH. I bet they’ve never had THAT experience before! Congrats Crystal, so proud of you! I wish I had your strong will and determination. What a blessing! What an inspirational story. Congratulations on being a home owner, free and clear. It is a blessing, as we know well, to own your own home in this day and age. We too have had to fore go a lot of perks (newer car, bigger TV’s, vacations, new wardrobes every season, etc…), but, we own our own home and that security is worth so much more than all the other “stuff” put together! Again, congratulations, enjoy, and may God keep blessing you and your family! I’ve been waiting all day for this post! Huge congratulations to you. You are a trophy of God’s grace! Congratulations!! I do not personally know you, but I am celebrating with you. I am so proud of you for working hard, saving and having a dream come true. Good for you !!! I know that there will be many memories made in this home. I am so grateful you gave due respect to God who provides us with everything, we have, we need or will have in the future. Thank you for sharing your Blessings with us. It’s beautiful!!! Congratulations and enjoy every minute in it. May God bless you abundantly in your new home. Congratulations on your new home. What a wonderful feeling to have a beautiful home and have paid cash. So many of us have been blessed by what we have learned from Dave Ramsey. May the Lord continue to bless you as you are obedient to Him and as you share your story. I too want to say Congratulations. My eyes are teary because I am so happy for you and your family. You are a great example of how it is SUPPOST to be done. Our family is working our debt snowball right now and it seems like it is taking forever. Your encouragement is very helpful and appreciated. God bless you and your family in your new and beautiful house! What an inspirational story….and beautiful kitchen! What a story. Congratulations on your new beautiful home. On a side note, you are a beautiful writer and have such a wonderful way with words! Wow!!!! That is so amazing! I hear about this being the goal for so many, but so few so diligent on working toward it….me included. Congratulations! Congratulations on your new home!! You have been a blessing to my family, with you blog. I pray God continue reigning blessings on you and your family! Lovely kitchen!!!! Thank you for sharing this! Your story brought tears to my eyes. Your dilligence in saving money is a real inspiration. so happy to finally see your beautiful home! WOW, amazing story! Congratulations! Are you still pinching yourself to see if it’s for real?? 🙂 Thank you so much for sharing your story…it is inspiring to many! How wonderful! God is indeed a good good God! And to think that one day, your children will rise up and thank you for being obedient and willing to put aside temporary pleasures for something longer lasting and beneficial to the whole family. You are going to be able to totally rock the Freezer Cooking Days in that big ole kitchen! Crystal, Congratulations! We are so happy for you. Amen! What a testimony! God bless you and your family in your new home! God is good! What a wonderful blessing you have received. Can’t wait to see more pictures!!! Crystal, I am so happy for you! What a testimony to so many people. Not only of the fruits of being frugal, but also of God’s grace and provision. May God bless you richly in your new home. I’m so happy for you. Your perseverance and faith has finally paid off. What a gorgeous kitchen! Many congratulations are due–not just for the wonderful house, but for what you did to earn and save for it. And now it’s all yours. Really yours and not a bank’s! So exciting!! What a large, beautiful kitchen! Congratulations on your new home and achieving such an amazing goal!!! Wishing you many, many happy memories in your new home! Congratulations!!!! I’m so happy to see this finally happen for your family. Following your updates last winter is how I first discovered Dave Ramsey’s plan and you have inspired me to change my family tree. I hope to someday post on here that we were able to pay cash for a house. Enjoy your paid for home!!! Crystal, this is such a beautiful house! So welcoming too…I feel like paying you a visit in it! Are you going to share more pictures of the rest of the house? We’ve been following your story here so long, that I wouldn’t mind being able to picture it better in my mind! The kitchen is the best place to take pictures anyway, though. I understand if there are privacy issues to be concerned about. I’m so glad you are blessed with such a lovely house! May it serve you well in the years to come as your family grows up. I love this post! What a great feeling it must have been to pay upfront and then get to walk into your new house – free and clear. Congratulations! I’m wondering if you got an inspector to check out the house before you bought it? It seems like there are so many steps to buying a home! Congrats again – what a very special milestone! Congratulations! Isn’t it awesome what God can and will do when we do things his way. He truly gives us the desires of our hearts. Thank you for the inspiration and reminder! All the glory goes to God!!!! Thank you for living it out before all of us. This reminds me of the man who broke the 4 minute mile. No one thought it could be done. The following year more broke it. You (by God’s grace) have broken the barrier of always having a mortgage payment. My race is next! I’m so very happy about your accomplishment. I concur with the others that your kitchen is beautiful. I’ve been following your blog for a little over a year now and have always admire how you put God first. He is truly the captain of your ship. My husband and I own our rental home outright, but sadly we pay about a $1,000 in interest each month on our primary residence. Once I read this, I realize that we can pay this mortgage off if we put our minds to it. Today, as I read your post, I commit myself to paying off a $238K mortgage in 7 years. We are blessed with a great income and with God’s help, I hope to some day write to you to tell you to tell you that I’m no longer a slave to the lender. Thank you for sharing your story; you’ve been an inspiration! Congratulations! I hope you’ll post more pictures in the future. I got chill bumps reading this! Praise God for blessing yall’s hard work and dedication to staying in HIS will. Thank you so much for posting this and inspiring others thru your ministry. This truly has made my day and I’ve never even met you! God is so good all the time! Many more blessings sister! Crystal, congrats!! Your story is very inspirational and thanks for sharing it with us. Congrats on your new home. It is so pretty! What an exciting financial goal to meet! Congrats, Crystal! That is a lot of work and a beautiful house! I love the house! I am inspired. CONGRATULATIONS CRYSTAL!!! What an amazing story (and great looking kitchen, btw). You have been such an inspiration and I think I have mentioned you on multiple occassions in the last several FPU Alumni Events I have hostedin our area. I’m sure the group will continue to hear more about you – and visit your site often. Congratulations on your house. I am so happy for you and your family. Congraulations on your new home. It is beautiful. what a testiment to God’s goodness!!! congratulations to your family!!! Outstanding Kitchen! Thank you for being such an inspiration. Can’t wait to see more! You deserve to be on cloud nine! You have worked hard for this day. I’m glad you didn’t settle for anything less. It’s beautiful! Congratulations! What a blessing, Crystal. God has truly been good to your family. The kitchen is beautiful. Congrats!! I AM SO HAPPY FOR YOU! That post brought tears to my eyes. Yes, God is good and He is receiving all of the glory through your testimony! Thank you so much for being such a wonderful testimony and sharing in how He is working in your life! Congratulations! I loved that both of your dads were involved in the process. I think it’s great to involve parents in big decisions like this, even if you’re an adult yourself. I also love that all the pictures in this post are of the kitchen! I’m sure that’s what I would be showing off, too. And a total inspiration to me. I’m believing God to be able to pay cash for our next house, and have been a bit bummed thinking that the only way we’ll be able to get a decent house is to buy a another fixer upper. (I’ve done that twice already, and I don’t want to move into another filthy dump and have to fix it up to make it nice, while I’m trying to live there!) Your post has encouraged me to dream bigger and not compromise……no matter how long it takes!! I could totally relate to your post about almost compromising because finding the house was taking so long. Thank you. Thank you!! Please….more pics!!! It’s beautiful!!! God is VERY good!!! AWESOME!!!! Congratulations to you guys!!!! Ohhh as I read your post my eyes got all misty and my heart soared with you in your excitement. Why you may ask? I guess it is because I soooooo understand your every feeling. At the beginning of last month we paid off our mortgage (paid it off in 7 1/2yrs). We feel out of this world honored and blessed to be in such an amazing place at 30 yrs old. It is worth every single effort and hard work to see our dream become a reality. I think people did alot of head shaking when we make some of the decisions we do. We are okay with that! 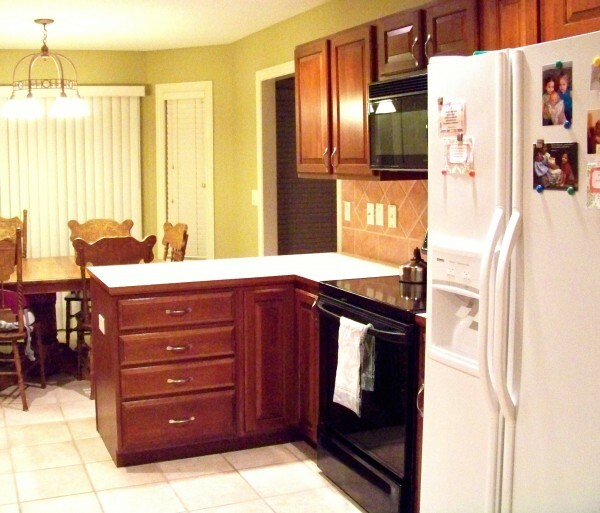 Congrats on your breaktaking kitchen…..I can see you with all your littles whipping up something wonderful! Hugs to you for all great things you share with others to inspire them. and I’m thankful for the blessing He has given you to be here for all of us as an inspiration! I am so incredibly happy for you and your family…you all deserve this beautiful home. Enjoy!! Congratulations Crystal, what a beautiful home! God is good! Way to go! Best wishes to you in your new home! Congratulations! What an incredible journey! How inspiring!! God is good!! Thanks for sharing your journey to home ownership. It has inspired my husband and I, we lost our house to foreclosure a few years back, it was a horrible experience. I planned on never buying another one, but you have made me realize I can pay cash down for one in the future. We live in Ohio so it is very feasible. But I wonder about people in high housing areas. My Mom and Dad live in British Columbia. My Mom is renting a 300+ thousand dollar apartment. It is not big, a small two bedroom. My Dad sold our family home for $350,000. He was saying to me when we discussed this topic that it would be impossible for him to save enough to buy a house in his area. I wonder how people in those areas can follow Romans 13:8? And I was thinking, if we rent, as my family does, are we not in debt in a way to our landowner? I’m curious what your thoughts are on these things? Thanks again for the inspiration. Your blog has changed my families life for the better! congratulations crystal and jesse-I know you and your family have made great sacrifices to get to this point, but so worth it! The kitchen is just beautiful and I know you will enjoy spending time there with your family! What a blessing!! I have been a long time reader of your blog. From the beginning, I have always thought our lives have been very similar. We are near the same age and my husband is also an attorney. We had our first child in his last year of law school. I just HAVE to know this please answer….. How did you save money to pay your student loans off before college in high school? It must have been what? Undergrad 20K? Law school 30-40? Please tell me your secret!! That’s the one think that I hate to have. Also our ONLY debt and would love to know how you paid such a large amount of money off, before law school. Again, congrats on your new home!! @Kerri, I have an article in the works on “How to Go to College Without Going Into Debt” which will share the principles we used, as well as many others we know. I think if more young people realized how possible it is to get an undergrad (and even masters or doctorate degree!) without debt, they’d be able to put themselves in a much better position financially! I would love to read that one! I have just started back to school and really don’t want to go into debt. Congratulations! You guys must be so thrilled! What a wonderful example of how hardwork and prayer can make great things happen! Congratulations to you and your family. That is really quite a fantastic accomplishment. From your pictures, it looks lovely! I know we have never met, but I feel like you are one of my best friends after following your blog for over a year now. Your story is so inspiring! Without a house payment, I don’t imagine it will take too long for you to replace Old Blue. Your kitchen is beautiful and I can’t wait for the baking day photos from it. Thanks to your example (both of frugality and faith!) my family is debt free except the mortgage. And we have a plan to pay it off in 6 years. I look forward to Baby Step 7 of giving more than any of the other steps. But you can’t skip any along the way to get there right? That is why they are called baby steps. Along with many others, I have been following you since your Biblical Womanhood days (even had all the e-books, though the computer ate them). Your various websites and efforts have been a blessing to me, and an encouragement. I am so pleased to how Heavenly Father has blessed you and your family for your efforts to be obedient. What a beautiful home! You are a wonderful example of what a follower of Christ should look like and act like. Thank you! Congratulations!! You are an inspiration to many. Okay, this brought tears to my eyes, the kind that are joyful and yet come from the deep place in my soul and attest to the truth of what happened by following God’s plan, not man’s. This is such a wonderful testimony. I couldn’t wait to see the kitchen pictures and it was beyond what I imagined. Congrats Sister! I’m so proud of you & your family!!! God has richly blessed your faithfulness and trust in Him. Crystal, I am beyond thrilled for you and Jesse!!!! It has been so exciting to follow along as you took this journey. You have worked hard and God has blessed abundantly!! Your home looks absolutely lovely. Thanks for letting us share in your joy! And like the others, having never met, I feel as if we are friends 🙂 I’ve been following along since the days when there were only three of you. I applaud you and your husband! Thank you for being a visible example for us on the internet. For showing us that this is not because of you, but because of God. I’m sure you might get hate mail or people that really question your lifestyle, but press on, sister! May your home be a light in your neighborhood and may Christ be glorified. I am so happy for you! Thank you for sharing…I have only started following your blog for about 2 months and it has been a huge blessing! Thanks to you and Life as Mom my husband and I have read Dave Ramsey’s book and have started on our journey to financial freedom. oh….and I must agree with you…..God is good!!!! Congratulations! What a blessing to own a home knowing your hard work and dedication have paid off. Hearty Congratulations Crystal 🙂 Very happy for you and your family. Enjoy your new home! WOW amazing! Im so happy for you guys. My husband and I started Dave Ramsey’s program June 2009 and have since paid off $34,200. Once we send the last check (hopefully the end of this month) we will be debt free. I cant tell you what a blessing this is to hear right now. My husband was just laid of (due to his office closing) and we have two kiddos (5months and 3 years) and live in California (not the best place to find a job). When I read your post a peace came over me, reminding me that He is bigger then all things, and that we will be fine as long as we continue to look to Him! Thank you so much, God is great! Enjoy your blessing, you guys deserve it! @Laura, What a wonderful reminder of how important it is to be debt free for times like you are experiencing. I hope your husband finds a new job very soon and you’re right…God is in control. He wants good things for us and is the giver of all good things! Blessings to you and your family. Wow! Congratulations! I love your kitchen, it’s beautiful! Thanks for your wonderful testimony, God is so good! Congrats on your new home! Thanks for the inspiration to live below our means and to remember that we don’t need all the material things we see around us! Crystal, we are so happy for you! It has been a joy to follow along on your journey. Your home is just beautiful! You are such an inspiration! I’m so excited for you Crystal! Thank you so much for all you do to encourage all of us towards frugal living – we have friends who just finished paying off their home and my husband and I were just discussing what that kind of freedom must feel like. Thanks for the inspiration! I love it!!! I can’t wait to see more! I am so happy and excited for you! Congratulations on finding and paying cash for such a wonderful home! I pray you will all make many happy memories there. Beautiful kitchen! It looks so big! I hope you will show us the rest of the house, and the outside! Congratulations on your new home! I know God will bless it richly for your faithfullness!! Praise God! So happy for you!! I am just so, SO excited and happy for you and your family. I have been following your blogs for over 3 years now, and I have seen how hard you and your husband have worked and saved to be able to make this dream come true. God is truly good, and I am so happy to see He has blessed you in such a wonderful way!! Congratulations! Congratulations Crystal, yes your hard work had finally paid off! I think it is wonderful the way you sought counsel from both of your fathers! What a gracious example of submission to authority and to the Lord’s leading. I have been following your blog for about a year now, but have never posted any comments before. I draw so much strength from your website and hope that one I day I can do the same as you have done! Congratulations on seeing your dream come true and prayers be answered. Thanks for being an inspiration to so many of us! I just wanted to say YOU AND YOUR Husband are AMAZING!!! What an insperation you both are. WOW comes to mind! LOVE IT! Great story, and I’ve been following along every step of the way. It’s such a lovely kitchen, can’t wait to see more pics! By you paying cash, does that mean you had no closing costs? Or perhaps less than what it would have been? @Kacie, You still have to pay “closing costs” when you purchase a home but they are just a minimal amount of money conpared to having a mortgage. Congratulations! God is so good and what an encouragement as I’m also dreaming of someday becoming a debt free homeowner! I’ve been following your blog for a little over a year, and it feels as if you’re one of my neighbors! Enjoy your lovely home! Absolutely perfect. You and your family have inspired me and my husband to believe that we can work towards being debt free. It is for sure not easy, but it will be so worth it, as you have shown us. Thanks for being so willing to share your story. I have been following your blog since you were pregnant with Silas and was impressed mostly by your wonderful attitude of NOT “keeping up with the jones” and having the faith and confidence not to need expensive things to fit in or be happy. You are providing a wonderful example for your children and think of the opportunities they will have since you are living debt free and saving for their future. I love your blog and freezer cooking and homeschool articles the best! House is gorgeous! Congratulations to you and your family! What an inspiration you are!! Wow. Those pictures are GORGEOUS! Please share photos of more of your home! You inspire me. My husband and I are working hard to pay off our debt (and are teaching our five year old why we should have never taken on debt in the first place! ), and we hope to pay cash for a home some day. God has truly blessed your efforts and sacrifice. Congratulations, and thank you for sharing your journey with the world. Congrats! That is awesome! I am just pleased as punch that our mortgage is under $100K. We are in So Cal, and the market here is terrible. I really want to pay it off, and we have the money, but with one in college and one to graduate next year, we will wait and pay a little to the principal each month. That is our only debt. So I am proud that we are not using ‘fake money’ as many out here do. Enjoy your new abode! I know you will. Crystal- Your blog is so encouraging to me. Your practical examples for living a Godly life are such a blessing and I’m so excited for you and your family as you settle into a new home! Thanks for sharing this. Thank you for sharing your wonderful testimony! Congrats! Being a new homeowner is such a fun time!!! Enjoy it because you guys deserve it! Thank you for being such a great role model! This is the very first I read your blog and am so amazed at what you have accomplised through your faith, what a testimony and example of God’s great love and work in your life. I will start reading your blog and greatly appreciate your testimony to others. Congrats Crystal. I love the principles in which you live your life by, and it’s obvious that both you and Jesse are experiencing God’s favor in your life right now. An incredible story/testimony that you have shared today. It’s been interesting and inspiring to follow this story through your previous posts. Congratulations! You have been so inspirational to me and my husband and I want to thank you! Your home looks beautiful! Crystal, What a lovely home! And to be worry-free of any mortgage! We purchased our home with cash. We tithe and support 3 missionaries. We are completely debt-free. It is very different from most people I know who scrape by and load up on other expenses. We just returned from a 24 day trip through the west. We were able to do it because we don’t have a house payment or car payment. You will ultimately have a better life by refusing debt. Amazing and inspiring! Congratulations! I’d love to see more pictures! Congratulations! You have a beautiful house. Congratulations to you and your family on this Blessing from God and for the strength and courage it took to walk under God’s obedience. “no good thing will He withhold from them that walk uprightly.” Psalm 84:11 May you all continue to bask in all the Blessings God has in store for you! Congrats! How very gazelle of you:) May it be a blessed home. So happy for you all. Reading about this brought tears to my eyes. I’m so excited to see how God did all this for you. Of course, you said no to many, many things and delayed your gratification. My parents, brought me up watching Mr. Jim Sammons, “Financial Freedom” videos:) What fun times and I’m glad they taught us to be frugal! Can’t say I’m Anywhere close to buying a home with cash (I’m an older single and out of a job right now; been a public school substitute the last four years) but I’m glad God has allowed me to live on a shoestring too:) Maybe someday I too will have your story. Congrats on your new home! GOD IS GOOD!! Your testimony of this experience has inspired my husband and I to save and do without things we really don’t need, so we can save for the farmette we have always wanted. 🙂 Thank you so much for your strong testimony! God Bless you and your family! You are truly an inspiring role model. Please keep up the good work. I love your website because your relationship with the Lord is so evident in every little detail of your life! This is just another credit to Him! and I am so excited for you guys. Congratulations and many blessings! The bible says obedience is better than sacrifice. You and your husband are living testamonies to how obedience to God is a blessing. I pray that God continues to allow you to share his goodness with others and influence us. Congrats! God is so good. Enjoy your new home! That is great….and God is AWESOME! Congrats to you guys! Congratulations! This is such an inspiring story! My husband and I have been married 6 years and have paid cash for everything besides our house. Your story makes me wish that we would have done that too. While we are definitely living within our means, it’s crazy to think how much money we have spent on interest!!!! Good job! Thanks so much Crystal! I’ve been following your blog for a few years now, and I literally just teared up reading this post! You are such an inspiration I Praise God for all the amazing blessings he has given us and especially for your motivation. I love your story- it is a joy to see how God works isn’t it? We too are debt-free. By no means are we rich but we have always lived well below our means. Our philosophy has always been “God really owns all of it- we are only stewards and caretakers of what He has entrusted to us.” It helps keep it all in perspective as we live in contentment with what we have and love to bless others when God shows us where and how. May Christ richly bless you as go from here! Wow! What a dream come true for you! Granted, we can only see pictures of the kitchen, but WOW! AND THANKS! We are looking to updgrade out condo’s kitchen and that’s the color of the cabinets I want. 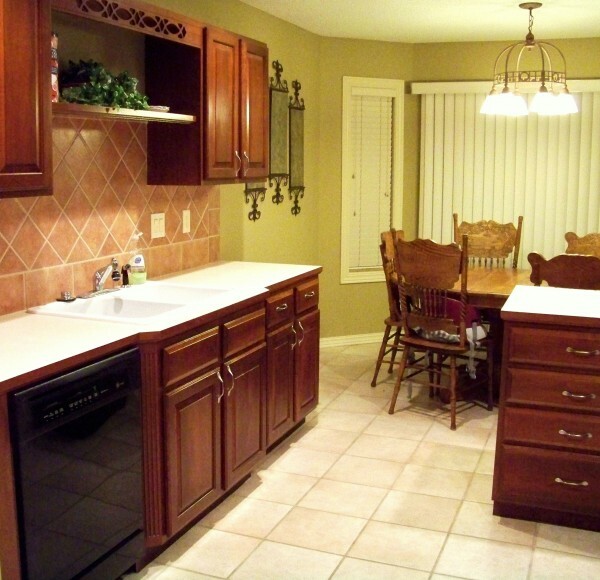 And I like the color contrast of the dark cabinets and the light countertop and tile floor. I may just have to copy that!!! DH also wants to redo all the flooring in the house as well…..oh brother! Congratulations. You deserve it after all the hard work your family has done. You are a great example to all of us (especially the long time subscribers like me). Thanks for being an uplifting part of my day, when I sit to read your blogs. Crystal, enjoy that new kitchen of yours, as it truly is the heart of the home. Such an inspiration! Thank you! thank you! Congrats!!! What a huge accomplishment this is! You’re home looks lovely!! You’re an amazing woman and an inspiration to everyone here! Enjoy your new home because you guys deserve it!!!!! Thanks so much for sharing, we just started the Ramsey plan in the fall. What an inspiration. It is so true that it is life changing when you get God’s perspective on His money. Celebrating with you and your family. I am also going to email a link to this post to several of my friend who are just getting started also. Your story is so inspirational; thanks for sharing your journey. Congratulations on your new home! That kitchen is absolutely gorgeous! Can’t wait to see more pictures. Congratulations! I LOVE hearing such inspirational stories like this! Congrats and enjoy! Last year we became REALLY committed to becoming debt free. A few months ago we made our last payment. No more farm, house, car, credit card, etc payments! We told some friends of ours that we were completely debt free (and have some savings too) and now we have about $40,000 worth of work we want to do to the home–their first question was “so you’re going to go get a $40,000 loan?”…..um NO! Good grief we didn’t work so hard to get to this point to turn around and get back in debt.. Nope, we’ll save up some more and do one project at a time. Congrats to you! The pictures are beautiful-I’m so glad this long journey has “paid off” for you. You are truly an inspiration. TOTALLY INSPIRATIONAL!! I hope the Today Show or someone picks this up! This is what AMERICA needs to hear. Thank you, than you, thank you! We have met and I have followed you since your Biblical Womanhood days. I thought you would reveal to us about how much the home cost. It is a lovely home and you and your family certainly deserve it ! God does provide for those of us who provide for others in their times of need. My saying when folks tell me I got really lucky was no I didn’t “God likes me because I am always nice (even when I don’t want to be) and I give even when I feel I can not to others who need it more. Bless you all. Hope to see more photos and a hint at what a home like that cost these days. Amazing! It’s so neat to see the fulfillment of all your prayers and disciplined hard work. I just feel like crying to think how wonderful you must feel! That is no small feat!!!!! congratulations!!!! So happy for you all – congratulations! I remember that giddy feeling of first entering our new house as homeowners. Love the kitchen – looks like a nice place. Brings me back to read your post. God is AMAZING! What a great feeling to be debt free! My husband and I are currently working on becoming debt free! It is such a great feeling to pay things off! Crystal and family, Congratulations! It’s breathtaking! Thanks be to God! Congrats! You’re right, the kitchen is beautiful! Did you paint or was is already painted that color? I love it! Congrats! What an amazing accomplishment for a young family to achieve! Once again, thank you for the inspiration and the reminder to Live Like No One Else so that later you can Live Like No One Else! This is awesome! What an inspiration. I think people just are so conditioned to think that you HAVE to be in debt for 30+ years in order to own a home. We USED to think that too but refinanced to 15 years and are working hard to pay the house off in half that time. I think we can do so much more for the Kingdom when we aren’t chained to a house payment and other forms of debt. I look forward to the day when I have true financial freedom. I am raising my kids to know that they do not have to be slaves to the world’s idea of prosperity. Thank you for your awesome example! This brought tears to my eyes. What a great story. Thanks for sharing and congratulations! How exciting for you, and what an awesome testimony of God’s faithfulness to honor His children when they follow His ways! Congratulations! Congrats! What a wonderful accomplishment and a beautiful house. You are so very blessed! I just love this! So happy for your family! Congrads on the new house.Love what it looks like. Congrats to your family. Hard work always pays off in the long run. Thanks for all you do for all your followers. That is awesome 🙂 I’m very impressed and hope that since I’ve started working on saving money that we may be able to do that as well one day. Congrats! It is wonderful that all of your hard work has paid off. May your days in this home be filled with happiness and love. What a great inspiration you are in a world driven by those living outside of their means in order to “appear” a certain way. Thank you for being authentic and vulnerable and sharing with us all your journey as a family. I hope my hubby and I will own a home one day and it would be wonderful to own it free and clear right away. I am so excited for you all! And I love how you are giving God the glory, even though you did some serious hard work yourselves. Well done! I am enjoying your satisfaction vicariously. Keep us up to date on how you are enjoying it all! I love these personal posts and the encouragement they bring to so many. What an awesome testimony! May your years in this home be filled with joy, laughter, sweet memories and the constant reminder of God’s blessing on your financial faithfulness. You guys rock!! P.S. The kitchen is lovely. When do we get to see the rest? Thanks for sharing your journey. You are an inspiration and encouragment. Congratulations on your accomplishment. Post some more pictures of your new home! I know I’m only one of many saying this, but congratulations! God IS good. Enjoy your new home. Congratulations! I so wish I would have had the mind set that you guys have years ago. Enjoy it! WOW that is SUCH a blessing and so awesome that you were so obedient to God. I know God can never steer you wrong and it is wonderful to see a family who still prays and believes in God. I am so happy for your family! Enjoy your new beautiful home! That’s amazing!!!! We are working on getting our house paid off so we can be completely debt free!!!!! It’s a another on-going “Acts” at this times. Congratulations and what an incredible testimony you have to share about God’s incredible blessings! Thanks for some pictures!!! It truly is a beautiful home with Jesus Christ as the Cornerstone. A belated congratulations, Crystal! Thanks for sharing the pictures. I can’t fully describe how much I am in awe of your accomplishment! CONGRATULATIONS to you and your sweet family. You are such and inspiration to so many and especially young families. I have sent so many people to your website( standing in line at the grocery store, friends , family etc) I am hopeful that more people will start trying to live similar to your family putting GOD and faith before every thing else, Thank you for all your hard work and Congratulations again. Oh yes, we all want to see more pictures!!! We, too, are looking to pay cash for a house. I thank God for your post today because we were looking at houses and your idea of looking up the assessed tax value may have just saved us THOUSANDS! God is so good! Congratulations! What a powerful story of patience and obedience. Your blog has always been inspiring in so many ways. Thank you so much for sharing. I hope you and your family enjoy your home for many years to come. What a beautiful new home & what a blessing! I read the post that you unfortunately chose to delete because of people taking it wrong. I just wanted to let you know that I think you had every right to publish that. It just showed the sacrifices that you made in order to be able to pay cash for a new home. We do some of those things, but not near all and not near to the extent that you’ve done. That’s just a personal choice. I’ve chosen to eat out when I know we could save more by eating at home. That is my choice. All those things that you did were your choice. We have the freedom of speech and you should be able to talk about your choices and decisions without readers freaking out. Just my opinion, now. I love this blog and thank you very much for all the work you do and how you’ve set an example of was is *possible* if we were all willing to make those same sacrifices. @onemotherslove, I didn’t get to read it – only the post after she said she deleted it due to comments. I sure wish I was able to just for the simple fact that I would love to know all and every way possible to see how to be as frugal as I can be. I am a very strong willed person and I would love the challenge if only I knew what more I can do that I’m not already. It’s great to see it work for others and then be able to practice. I’m just shaking my head that others would make comments negatively against someone with such a fantastic goal and heart after God to the point where it is felt to delete it all. Maybe someone could share this with me as to inspire me and possibly get me to think a little more intently. @Michelle, I agree. I wash shocked that people would put hateful things. I was debt-free (execpt for mortage), then started a business. Unfortunately, I am now loaded with debt and am climbing back out. I don’t go the austerity route myself, but find myself motivated and uplifted by this blog. It would be nice if she could repost it with the comments off, if nothing else. I have been waiting for this post! Thank you so much. I was really, really hoping you would post pictures of it and I am so glad you did. What an an exciting and inspirational day!! Thank you for your story. I cried as I saw the confirmation of God’s promises in your life. I am believing for a miracle in our lives also, and your story was a comfort and encouragement to just hold on to what Gods has promised. Thank you so much. YOU GO GIRL!!!! My husband and I are in the middle of our debt snowball, and I LIVE to hear stories like yours! I need need need to be inspired as we pull ourselves out of the massive debt that we created! Thank you for sharing with us! I just want you to know that I read the response that you had to put on your emails about this being a burden to some people. Unfortunately, doing what God wants you to do and following His will for your lide will make some people unhappy. I am very excited for you and your family, and I want you to know that you have helped me with saving money on my groceries and getting great coupons and savings. Thank you so much for what you do, and for glorifying God through all of it! I had skimmed your article when it came across my email yesterday, and after today’s post, of course I went back and re-read it carefully looking for the part that would have been burdensome or offensive. Uh, couldn’t find it. Looked again. Couldn’t find it. We are to be “in this world but not be of it” and you have certainly shown that when we take a stand to follow Christ and live by Godly principles then we will face some sort of opposition. What an encouragement your story is! “I can do all things through Christ”… remember the story of the talents? This is the modern-day version. Congratulations, and thank you for sharing. That is SO awesome!!! You give us all inspiration! Congratulations and I hope your new home brings you many wonderful memories and even more blessings! God bless! THANK you for sharing your life with us! Reading this post also brought tears to my eyes and I have shared the story with so many people and they are all so amazed! My husband and I started Financial Peace in March 2010 and are still working on baby step 1, but the debts are beginning to decrease and it feels so good! Thanks for sharing your tips on saving money. I don’t know what would have been offensive and remember what Dave says, “Live like no one else so you can live like no one else!” You guys got it and should be proud of your hard work! Our God is an awesome God! congrats! The house is just beautiful! God is sooo good! totally inspiring. Many congrats and blessings to you! WOW!!!!! This blows my mind- NO debt, NO mortgage…That house is really, truly YOUR home….What an accomplishment!!!!!!! I just wanted to say, Congratulations! Enjoy the home that God has blessed you with and know that you are such an inspiration to so many. Congratulations on your purchase. I have been showing your site to my sons, grades 8 and 7 for encouragement. I have a little put aside for their education, but they are going to have to finance most of it themselves. I have been wondering if I should cancel their RRSP’s and pay off my house. I guess you would be saying yes. I’m so super excited for your family – God is so good and has truly blessed your lives. I have a quesstion in my pursuit: As you were saving for your 100% down on your home, where did this money sit? In a shoebox? in a savings acct? in a money market account? was it accessible for the exact time you needed it? was it making money for you as well? I just got lost at this point and can’t seem to figure this step out. Thank you so much for all the encouragement you have given me. I love love love Dave Ramsey as well. I also drive a 1998 explorer and hope to for at least another 2 years while becoming debt free. I actually only have student loan left so I’m getting pretty excited as I can start to see the light a little better. Thanks for the answer to the question in advance and being an inspiration. Love your blog! Congratulations! This is so inspirational. Congratulations Crystal! I am so happy for you and Jesse. You sure earned it! So happy for you that you got a very nice place. I love your blog so much how God’s glorify in many ways!! We are also trying to buy our second home with cash, too so it will take a while, but we are pretty excited what the Lord has for us, too:) My hubby is working full time and going school. I also have one son to take care of which is not easy sometimes, but God has been abundantley blessing and providing us faithfully. So nice to see His grace in your life. Congrats on being a home owner!!!! Congratulations!! You are inspiring me to try to do the same. I am not sure we can do the whole no debt route yet due to recent happenings, but it is my new goal to to save all the money for a house. We currently own and are VERY close to selling and downsizing so we can save monthly. My question to you is what are you saving for now, now that you are in a house without a mortgage payment? Are you just putting the money in savings or do you have a new goal?